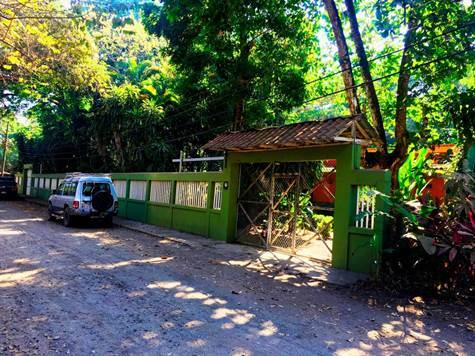 "2 MINUTE WALK TO BEACH"
This beautiful 2 bedroom 2 bath home is just very few steps to the spectacularly unspoiled beaches of Esterillos Oeste, popular with tourists, families, surfers and residents alike. The property is completely walled and filled with flowering, fruit and shade trees of many kinds. There is a guest cottage with a full bathroom for family, friends and vacation rental income too. The main house also features two large terraces to enjoy the tropical weather, breezes, birds, wildlife and lush landscaping. And there is a beautiful mozaic tiled outdoor shower to rinse off after a fun day on the beach, plus plenty of room for your surfboards and other beach toys in two large storage rooms. Wake up every morning to the sweet sounds of birds chirping and marvel at the multitude of parrots and majestic scarlet macaws that visit the area nearly every evening at sunset. The award-wining blue flag beach only steps outside your front door, is renowned for its fun surfer\'s wave on one end and tranquil tidal pools on the other end. These pools are created by an underwater volcanic reef that every low tide when the water recedes reveal little swimming holes where you can relax and soak in the warm waters of the Pacific. And toward the north side of the beach you can walk for miles along a protected shoreline where monkeys, macaws, sloths and other wildlife play. This home sits so close to the beach, you can hear the waves lapping at the shore and feel the ocean breezes both night and day. And since the beach faces south you have spectacular sunrises in the morning and truly magnificent sunsets each evening. The home comes fully furnished and it has an open floor plan with plenty of space to relax and entertain friends both inside and out on your covered porches. The floors are ceramic tile throughout with beautiful wood ceilings in every room too. The privacy wall surrounding the compound provides extra security as do the decorative security bars. There is also a beautiful cut stone facade around the home\'s entire perimeter and the gardens are lushly landscaped with lovely hedges aligning its walkways. If you\'ve been craving the salt life on a beautiful unspoiled beach, this could be the perfect chance to make those dreams come true at a very affordable price. Live here full-time or come and go and earn substantial vacation rental income when you are not using your little slice of heaven in paradise. And now might just be the time as all the roads into and out of this popular little beach town have been recently paved. Plus there are a number of fine restaurants all within walking distance, and dozens more just a short drive away. Jaco Beach with all its shops, restaurants, nightlife and other fun activities are only a half hour to the north, while Manuel Antonio is only 40 minutes to the south.